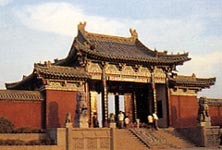 Located along the lakeside of Baogong (Lord Bao), the temple was built to commemorate Lord Bao Zheng (999-1062), an upright official of the Kaifeng Government during the Northern Song Dynasty (960-1127). The temple covers 1, 000 square meters in area. The main hall enshrines a statue of Lord Bao and introduces the life of Bao Zheng.